A recent article I read highlights just how seriously the attorney-client relationship is taken in the courts. According to the ABA journal, an Indiana judge is considering dropping a homicide case because police listened in on conversations between an attorney and client. 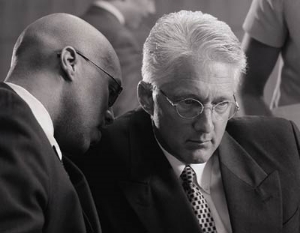 The client (defendant in the criminal case) has filed a motion to throw out evidence, evidence lawyers say reflect a 2012 conversation between the client and his previous counsel that took place at a jail. The government (of course) says the recording was accidental. Earlier this year, the same judge ruled that "seven police officers who took the Fifth during an evidentiary hearing in the Michigan City murder case against Brian Jordan Taylor could not testify at his trial," thereby practically destroying the government's case against Taylor. Courts take such things very seriously. If there is even a hint that the government obtained evidence illegally by listening in on attorney-cleint conversations, the case will likely be dismissed. That is how stringently the attorney-cleint relationship is protected. Newer PostCalifornia's New Gun Law Allows Ex Parte Seizure of Guns. Will It Work? Older PostHeld in Jail in American Forever Without Charges or Guilt? Yes, in Mississippi.